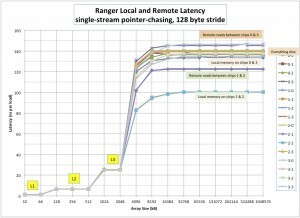 In an earlier post, I documented the local and remote memory latencies for the SunBlade X6420 compute nodes in the TACC Ranger supercomputer, using AMD Opteron “Barcelona” (model 8356) processors running at 2.3 GHz. Compared to the previous results with the AMD Opteron “Barcelona” processors on the TACC Ranger system, the “Shanghai” and “Istanbul” processors have a more advanced memory controller prefetcher, and the “Istanbul” processor also supports “HT Assist”, which allocates a portion of the L3 cache to serve as a “snoop filter” in 4-socket configurations. The “Magny-Cours” processor uses 2 “Istanbul” die in a single package. Note that for the “Barcelona” processors, the hardware prefetcher in the memory controller did not perform cache coherence “snoops” — it just loaded data from memory into a buffer. When a core subsequently issued a load for that address, missing in the L3 cache initiated a coherence snoop. In both 2-socket and 4-socket systems, this snoop took longer than obtaining the data from DRAM, so the memory prefetcher had no impact on the effective latency seen by a processor core. “Shanghai” and later Opteron processors include a coherent prefetcher, so prefetched lines could be loaded with lower effective latency. This difference means that latency testing on “Shanghai” and later processors needs to be slightly more sophisticated to prevent memory controller prefetching from biasing the latency measurements. In practice, using a pointer-chasing code with a stride of 512 Bytes was sufficient to avoid hardware prefetch in “Shanghai”, “Istanbul”, and “Magny-Cours”. The values for the Opteron 2222 are from memory, but should be fairly accurate. The local latency value for the Opteron 2356 is from memory, but should be in the right ballpark. The latency is higher than the earlier processors because of the lower core frequency, the lower “Northbridge” frequency, the presence of an L3 cache, and the asynchronous clock boundary between the core(s) and the Northbridge. The script used for the Opteron 2389 (“Shanghai”) did not correctly bind the threads, so no remote latency data was collected. The script used for the Opteron 2435 (“Istanbul”) did not correctly bind the threads, so no remote latency data was collected. The Opteron 6174 was not tested in the 2-socket configuration. 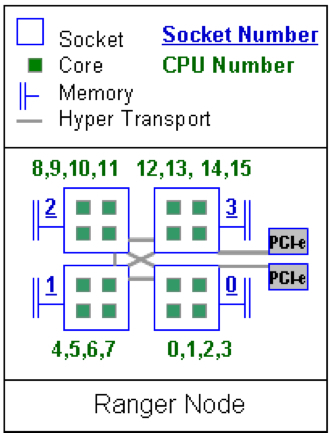 On the 4-socket Opteron 8356 (“Barcelona”) system, 2 of the 4 sockets have a local latency of 100ns, while the other 2 have a local latency of 133ns. This is due to the asymmetric/anisotropic HyperTransport interconnect, in which only 2 of sockets have direct connections to all other sockets, while the other 2 sockets require two hops to reach one of the remote sockets. On the 4-socket Opteron 8356 (“Barcelona”) system, the asymmetric/anisotropic HyperTransport interconnect gives rise to several different latencies for various combinations of requestor and target socket. This is discussed in more detail at AMD “Barcelona” Memory Latency. Starting with “Istanbul”, 4-socket systems have lower local latency than 2-sockets systems because “HyperTransport Assist” (a probe filter) is activated. Enabling this feature reduces the L3 cache size from 6MiB to 5MiB, but enables the processor to avoid sending probes to the other chips in many cases (including this one). On the 4-socket Opteron 8435 (“Istanbul”) system, the scripts I ran had an error causing them to only measure local latency and remote latency on 1 of the 3 remote sockets. Based on other system results, it looks like the remote value was measured for a single “hop”, with no values available for the 2-hop case. On the 4-socket Opteron 6140 (“Magny-Cours”) system, each package has 2 die, each constituting a separate NUMA node. The HyperTransport interconnect is asymmetric/anisotropic, with 2 die having direct links to 6 other die (with 1 die requiring 2 hops), and the other 6 die having direct links to 4 other die (with 3 die requiring 2 hops). The average latency for globally uniform accesses (local and remote) is 133ns, while the average latency for uniformly distributed remote accesses is 144ns. This disappointingly incomplete dataset still shows a few important features…. Processor frequencies are not increasing. DRAM latencies are essentially unchanged over this period — about 15 ns for DRAM page hits, 30 ns for DRAM pages misses, 45 ns for DRAM page conflicts, and 60 ns for DRAM bank cycle time. The latency benchmark is configured to allow open page hits for the majority of accesses, but these results did not include instrumentation of the DRAM open page hit rate. Many design changes act to increase memory latency. Major factors include the increased number of cores per chip, the addition of a shared L3 cache, the increase in the number of die per package, and the addition of a separate clock frequency domain for the Northbridge. There have been no architectural changes to move away from the transparent, “flat” shared-memory paradigm. Instead, overcoming these latency adders required the introduction of “probe filters” – a useful feature, but one that significantly complicates the implementation, uses 1/6th of the L3 cache, and significantly complicates performance analysis. This is primarily due to the addition of the L3 cache, the increase in the number of cores, and the increase in the number of die per package. The pointer-chasing latency code was run for all 64 combinations of data binding (NUMA nodes 0..7) and thread binding (1 core chosen from each of NUMA nodes 0..7). It was not initially clear which topology was used in the system under test, but the observed latency pattern showed very clearly that 2 NUMA nodes had 6 1-hop neighbors, while the other 6 NUMA nodes had only 4 1-hop neighbors. 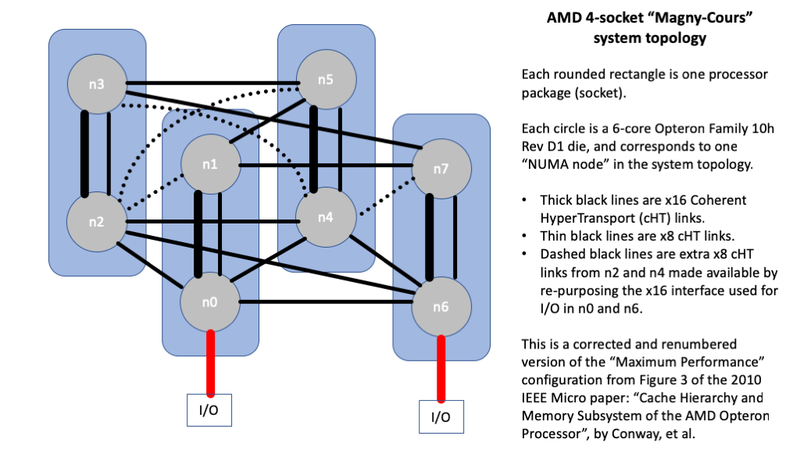 This property is also shown by the “Max Perf” configuration from Figure 3(c) of the 2010 IEEE Micro paper “Cache Hierarchy and Memory Subsystem of the AMD Opteron Processor” by Conway, et al. (which I highly recommend for its discussion of the cache coherence protocol and probe filter). The figure below corrects an error from the figure in the paper (which is missing the x16 link between the upper and lower chips in the package on the left), and renumbers the die so that they correspond to the NUMA nodes of the system I was testing. The bandwidth patterns are much less pretty, but that is a much longer topic for another day…. In the previous post, I published my best set of numbers for local memory latency on a variety of AMD Opteron system configurations. Here I expand that to include remote memory latency on some of the systems that I have available for testing. 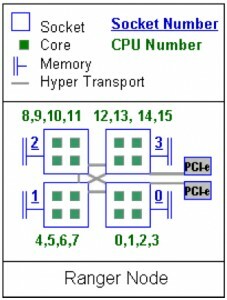 The on-node interconnect topology of the SunBlade X6420 is asymmetric, making maximum use of the three HyperTransport links on each Opteron processor while still allowing 2 HyperTransport links to be used for I/O. As seen in the figure below, chips 1 & 2 on each node are directly connected to each of the other three chips, while chips 0 & 3 are only connected to two other chips — requiring two “hops” on the HyperTransport network to access the third remote chip. Memory latency on this system is bounded below by the time required to “snoop” the caches on the other chips. Chips 1 & 2 are directly connected to the other chips, so they get their snoop responses back more quickly and therefore have lower memory latency. Ranger Compute node processor interconnect. 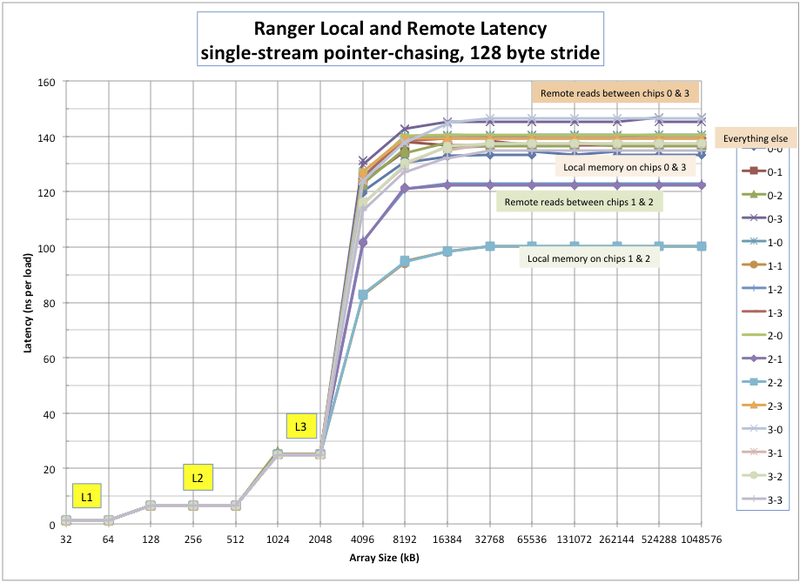 Cache latency and local and remote memory latency for Ranger compute nodes. A reader of this site asked me if I had a detailed breakdown of the components of memory latency for a modern microprocessor-based system. Since the only real data I have is confidential/proprietary and obsolete, I decided to try to build up a latency equation from memory…. It is possible to estimate pieces of the latency equation on various systems if you combined carefully controlled microbenchmarks with a detailed understanding of the cache hierarchy, the coherence protocol, and the hardware performance monitors. Being able to control the CPU, DRAM, and memory controller frequencies independently is a big help. On the other hand, if you have not worked in the design team of a modern microprocessor it is unlikely that you will be able to anticipate all the steps that are required in making a “simple” memory access. I spent most of 12 years in design teams at SGI, IBM, and AMD, and I am pretty sure that I cannot think of all the required steps. Here is a sketch of some of the components for a simple, single-chip system (my AMD Phenom II model 555), for which I quoted a pointer-chasing memory latency of 51.58 ns at 3.2 GHz with DDR3/1600 memory. I will start counting when the load instruction is issued (ignoring instruction fetch, decode, and queuing). The load instruction queries the (virtually addressed) L1 cache tags — this probably occurs one cycle after the load instruction executes. Simultaneously, the virtual address is looked up in the TLB. Assuming an L1 Data TLB hit, the corresponding physical address is available ~1 cycle later and is used to check for aliasing in the L1 Data Cache (this is rare). Via sneakiness, the Opteron manages to perform both queries with only a single access to the L1 Data Cache tags. Once the physical address is available and it has been determined that the virtual address missed in the L1, the hardware initiates a query of the (private) L2 cache tags and the core’s Miss Address Buffers. In parallel with this, the Least Recently Used entry in the corresponding congruence class of the L1 Data Cache is selected as the “victim” and migrated to the L2 cache (unless the chosen victim entry in the L1 is in the “invalid” state or was originally loaded into the L1 Data Cache using the PrefetchNTA instruction). While the L2 tags are being queried, a Miss Address Buffer is allocated and a speculative query is sent to the L3 cache directory. I can’t think of a way to precisely determine the time required to identify an L3 miss, but estimating it as 1/2 of the L3 hit latency is probably in the right ballpark. So 24.2 clock cycles at 3.2 GHz contributes the first 7.56 ns to the latency. Once the L3 miss is confirmed, the processor can begin to set up a memory access. The core sends the load request to the “System Request Interface”, where the address is compared against various tables to determine where to send the request (local chip, remote chip, or I/O), so that the message can be prepended with the correct crossbar output address. This probably takes another few cycles, so we are up to about 9.0 ns. The load request must cross an asynchronous clock boundary on the way from the core to the memory controller, since they run at different clock frequencies. Depending on the implementation, this can add a latency of several cycles on each side of the clock boundary. An aggressive implementation might take as few as 3 cycles in the CPU clock domain plus 5 cycles in the memory controller clock domain, for a total of ~3.5 ns in the outbound direction (assuming a 3.2 GHz core clock and a 2.0 GHz NorthBridge clock). begin to set up the DRAM access. For the probes, it looks like four asynchronous crossings are required (requesting core to memory controller, memory controller to other core(s), other cores to memory controller, memory controller to requesting core). (Probe responses from the various cores on each chip are gathered by the chip’s memory controller and then forwarded to the requesting core as a single message per memory controller.) Again assuming 3 cycles on the source side of the interface and 5 cycles on the destination side of the interface, these four crossings take 3.5+3.1+3.5+3.1 = 13.2 ns. Each of the other cores on the chip will take a few cycles to probe its L1 and L2caches — I will assume that this takes about 1/2 of the 15.4 cycle average L2 hit latency, so about 2.4 ns. If there is no overhead in collecting the probe response(s) from the other core(s) on the chip, this adds up to 15.6 ns from the time the System Request Interface is ready to send the request until the probe response is returned to the requesting core. Obviously the core won’t be able to process the probe response instantaneously — it will have to match the probe response with the corresponding load buffer, decide what the probe response means, and send the appropriate signal to any functional units waiting for the register that was loaded to become valid. This is probably pretty fast, especially at core frequencies, but probably kicks the overall probe response latency up to ~17ns. For the memory access path, there are also four asynchronous crossings required — requesting core to memory controller, memory controller to DRAM, DRAM to memory controller, and memory controller to core. I will assume 3.5 and 3.1 ns for the core to memory controller boundaries. If I assume the same 3+5 cycle latency for the asynchronous boundary at the DRAMs the numbers are quite high — 7.75 ns for the outbound path and 6.25 ns for the inbound path (assuming 2 GHz for the memory controller and 0.8 GHz for the DRAM channel). There is additional latency associated with the time-of-flight of the commands from the memory controller to the DRAM and of the data from the DRAM back to the memory controller on the DRAM bus. These vary with the physical details of the implementation, but typically add on the order of 1 ns in each direction. I did not record the CAS latency settings for my system, but CAS 9 is typical for DDR3/1600. This contributes 11.25 ns. On the inbound trip, the data has to cross two asynchronous boundaries, as discussed above. Most systems are set up to perform “critical word first” memory accesses, so the memory controller returns the 8 to 128 bits requested in the first DRAM transfer cycle (independent of where they are located in the cache line). Once this first burst of data is returned to the core clock domain, it must be matched with the corresponding load request and sent to the corresponding processor register (which then has its “valid” bit set, allowing the out-of-order instruction scheduler to pick any dependent instructions for execution in the next cycle.) In parallel with this, the critical burst and the remainder of the cache line are transferred to the previous chosen “victim” location in the L1 Data Cache and the L1 Data Cache tags are updated to mark the line as Most Recently Used. Again, it is hard to know exactly how many cycles will be required to get the data from the “edge” of the core clock domain into a valid register, but 3-5 cycles gives another 1.0-1.5 ns. The preceding steps add up all the outbound and inbound latency components that I can think of off the top of my head. I don’t know how much of the above is correct, but the match to observed latency is closer than I expected when I started…. The inference of 18 memory controller clock cycles seems quite reasonable given all the queues that need to be checked & such. I have a feeling that my estimates of the asynchronous interface delays on the DRAM channels are too high, but I can’t find any good references on this topic at the moment. In an earlier post (link), I made the off-hand comment that local memory latency was only weakly dependent on CPU and DRAM frequency in Opteron systems. Being of the scientific mindset, I went back and gathered a clean set of data to show the extent to which this assertion is correct. The following table presents my most reliable & accurate measurements of open page local memory latency for systems based on AMD Opteron microprocessors. These values were obtained using a pointer-chasing code (similar to lat_mem_rd from lmbench) carefully implemented to avoid memory prefetching by either the CPU cores or the Memory Controller. These results were obtained using a pointer-chasing stride of 320 Bytes, modulo 32768 Bytes. This scheme results in five passes through each 32 kB region of memory, resulting in loading every cache line but without activating the core prefetcher (which requires the stride to be no more than one cache line) or the DRAM prefetcher (which requires that the stride be no more than four cache lines on the system under test). Large pages were used to ensure that each 32kB region was mapped to contiguous DRAM locations to maximize DRAM page hits. The results above show that the variations in (local) memory latency are relatively small for this single-socket system when the CPU frequency is varied between 2.1 and 3.2 GHz and the DRAM frequency is varied between 533 MHz (DDR3/1066) and 800 MHz (DDR3/1600). Relative to the default frequencies, the lowest latency (obtained by overclocking the DRAM by 20%) is almost 5% better. The highest latency (obtained by dropping the CPU core frequency by ~1/3 and the DRAM frequency by about 20%) is only ~8% higher than the default value. I need to use the whiteboard in my office for something else, so it is time to transcribe the table of Opteron system memory latencies from there to here. The following table presents my most reliable & accurate measurements of open page memory latency for systems based on AMD Opteron microprocessors. These values were obtained using a pointer-chasing code (similar to lat_mem_rd from lmbench) carefully implemented to avoid memory prefetching by either the CPU cores or the Memory Controller. Results Updated 2010-10-04 to provide separate 1 socket and 2 socket numbers!! Memory latency is weakly dependent on CPU frequency, Northbridge frequency, and DRAM frequency in Opteron systems. Memory latency is controlled by the longer of the time required to get the data from DRAM and the time required to receive “snoop responses” from all the other chips in the system. The memory controller in K8 Opterons runs at the full CPU speed, while the memory controller in Family10h Opterons runs at a lower frequency. The difference in frequencies between the CPU and memory controller in Family10h Opterons requires an asynchronous boundary between the two. This increases latency. Family10h Opterons have a shared L3 cache that must be checked before sending load requests to memory. Since the L3 cache is physically larger than the L2 caches and is shared across all the cores on the chip, extra latency is incurred for requests that miss in the L3 and go to memory. Family10h Opterons support the HyperTransport version 3 protocol (though Revisions B & C run in HyperTransport version 1 compatibility mode), which appears to add some latency to the probe responses. Family10h Revision B and C Opterons in 4-socket systems may have different latencies for different sockets, depending on the details of the HyperTransport interconnect. On the TACC “Ranger” system, the SunBlade x6420 nodes have two sockets that have direct connections to all the other sockets, and two sockets that are only connected to two of the other three sockets. The sockets with direct connections to all other sockets display a local memory latency of 100 ns, while the sockets that are not directly connected to all other sockets have to wait longer for some probe responses and show a latency of 130 ns. Family10h Revision D0 4-socket systems have decreased memory local memory latency because of the “HT Assist” feature, which uses 1 MB of the shared L3 to maintain a directory of lines that are potentially in a modified state in another processor’s cache. If the cache line is not listed in the directory, then the value in memory is current and probes do not need to be broadcast to other chips if all you want to do is read the data. If anyone has a working 4-socket Family10h Revision C2 (“Shanghai”) system, I would like to run this benchmark to fill in the last entry in the table!